It’s a Bit Fishy, one of the finest restaurants in Barbuda, is owned and run by Arthur and Rosalind Walter. 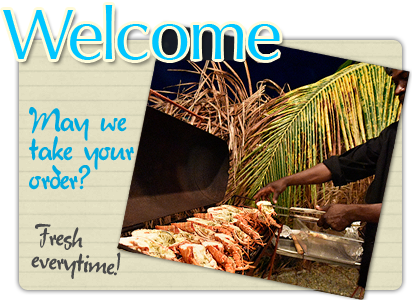 Located on River Road and open daily for fish, lobster, conch and meats from the grill. Call us to see what’s on the menu! Stop by and try some of our fishy treats, enjoy a cocktail at the fully stocked bar then sit under the stars and feel the sand between your toes! Reservations are a must during the week so we can guarantee your menu selection. On Friday’s we get a little more social! Pick something from the grill then wait for the fun to start - usually a karaoke battle with some talented and not so talented local customers!! Or perhaps a live band or local DJ for some dancing. Although we usually only open in the evenings, just let us know if you would like to come for lunch, or if you just want to stop by for an ice cold beer. Whatever it is - we’d love to meet you! We are also available for private functions either at our restaurant or pretty much any beach location on the island. You name it, we’ll do it! We look forward to seeing you at It’s a Bit Fishy! Need fresh seafood for your business or home? Call us to make your order.